Fiction: The tunnel will never be built. They’ve been talking about it for years! FACT: They’ve been talking about an above-ground freeway for years which would’ve put all the homes in Emery Park and South Pasadena at risk for demolition. That didn’t happen because of community opposition to it. The Environmental Impact Report (EIR) is now out, and there are 120 days (until mid-July) for the public to read the report share your thoughts. Fiction: A tunnel will help ease traffic congestion on Fremont and protect the children and pedestrians. FACT: 60,000+ cars daily (a 35% diversion rate) will avoid taking the 710 tunnel because of the $6-15 toll per vehicle, according to CalTrans/Metro, and they will siphon onto Alhambra’s streets. Read more here. Fiction: The tunnel will alleviate traffic on our freeways. FACT: No. Induced demand (Read Duranton – Turner Report: Road Congestion) means there will be more traffic. If you build it, they will come. Look at the 405 freeway. There is still congestion after they have widened the freeway. Also, there will be backed-up traffic at the 210 junction, which is already very crowded around the Rose Bowl. Read Wired.com’s 2014 article about induced demand. Fiction: The polluted air from the tunnel will stay in the tunnel and/or be cleaned by special vents before it ever comes above ground in Alhambra. 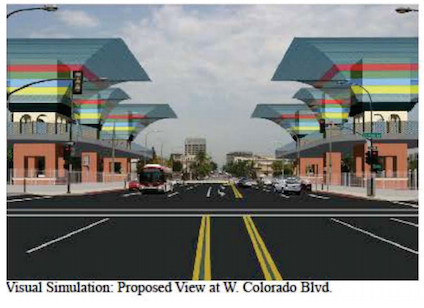 Fiction: Alhambrans will be able to take the tunnel freeway and get where they need to go. FACT: The entrance to the tunnel would be 1/2 mile south of the 10 freeway, in the City of Los Angeles. There will be no way to enter or exit the tunnel from Valley Blvd. in Alhambra. (See map of planned tunnel portals) The tunnel would be 4.5 miles long without any off-ramps. If you do want to drive the extra few miles south to enter the tunnel and pay the toll, get ready for clogged traffic at the east-west 134-210 junction where the tunnel would let out its traffic. Who will really be profiting from this tunnel? Who exactly wants this tunnel? Fiction: The tunnel will promote more business in Alhambra because people will come to Alhambra more easily. FACT: With no exits in the tunnel, this is not good for Alhambra business. Drivers coming from the north would have to exit the tunnel south of the 10 freeway (not at Valley or any other exit, as there would be none) and circle back several miles to get to back Alhambra. Shoppers from the east, west and south will get to Alhambra the same way they do now, on surface streets. Fiction: A freeway tunnel under ground is better than an above-ground freeway, at least. FACT: It’s not either-or. A tunnel freeway is just as hazardous and problematic as a freeway running through our back yards. Construction costs 10x more than surface work, and $100,000,000 a year to maintain. Let’s not forget the 10 years of construction it will take to build, according to Caltrans/Metro: 10 years of shaking, dirt, noise and trucks in Alhambra. Fiction: Modern technology will make the tunnel safe. FACT: If there is an fire or explosion, there will be no way to escape. Do your remember the explosion in Switzerland a few years ago? More recently in Seattle, Big Bertha, the tunnel boring machine attempting to dig the SR-99 Alaskan Way Viaduct replacement tunnel, is causing subsidence of the earth and is having an impact on buildings in the area. Read more here. Fiction: Voters and residents want the tunnel. Fiction: The tunnel won’t cost that much. FACT: See Costs to Taxpayers and more about Seattle’s own current tunnel fiasco. Fiction: A lot of communities want the tunnel. FACT: Resolutions and statements against the 710 extension. Over 30 cities, neighborhood associations, health organizations, school districts and other agencies have officially opposed it, including the City of Los Angeles and Mayor Eric Garcetti, El Sereno, Glassell Park, Lincoln Heights, Mt. Washington, Highland Park, Eagle Rock, Glendale, La Crescenta, and South Pasadena. The Bottom Line: Times have changed! There are other options.